The first picture of Volvo Cars' all new estate, shows a car that will be the company's safest, sportiest and most versatile five door ever. 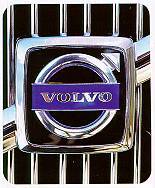 Aimed at retaining Volvo Cars' leadership in the premium large estate market, the car will be one of the first cars to be launched in the new millennium, making its world debut at the Detroit Motor Show and London Boat Show simultaneously on 10 January 2000. 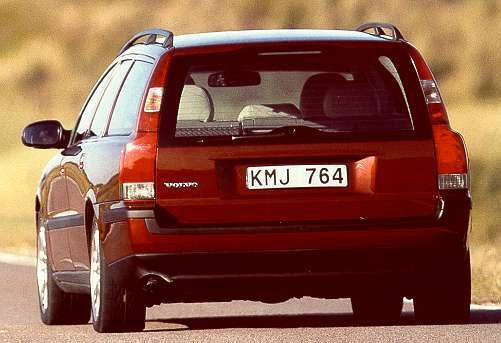 Launched initially with a range of five-cylinder, turbocharged engines, the flagship model will be a new version of the highly acclaimed T-5 - the original Volvo performance estate that captured the imagination of driving enthusiasts - and police forces - throughout the UK. The new T-5 boasts silky smooth performance from its 250bhp powerplant that develops 330Nm of torque across a wide powerband ranging from 2,400 to 5,200 rpm, to ensure that instant acceleration is always on tap. But modifications to the engine to maximise performance have not been at the expense of fuel economy. Fuel consumption will be as low as 9.3 litres/100km making the T-5 a class leader when it comes to economy in the performance estate sector. Volvo have already unveiled the world's first rearward-facing child seat that will fit in the standardised ISOFIX attachment, and a special dual stage airbag that automatically senses the degree of severity of an accident. Both these innovations will be incorporated into the new estate. Says Bodil Eriksson, Volvo Cars' Head of Corporate Communications: "This car is not only one of the safest estates ever mode, most probably the safest , but it is also a Volvo that complies with every customer demand relating to versatility, driving pleasure and excellent handling. We feel confident that our all new estate will come up to and even surpass our customers exacting expectations. The new car will also continue Volvo Cars' bold new styling programme that has radically re-shaped the product range in the past few years." Adds Volvo Cars' Design Director, Peter Horbury: "The marked shoulders under the side windows give the car a muscular look and the obvious arrow-like design makes the car look sporty." Sales start in the UK immediately following the unveiling of the car on 10 January 2000 when full details of its designation, pricing and specifications will be revealed. Cars will arrive in UK dealer showrooms from February onwards.